To create a sustainable and successful marketplace, you need to find a marketplace business model that will finance its operations. For the advancement of technology, marketplace is brought online and quickly becomes a popular trend. As an online marketplace owner, you know very well that to create a marketplace is a real step not only at your professional level but also in your personal life. Coming up with an idea and creating your online marketplace is just the very beginning. In fact, it takes a lot of work to launch a successful marketplace business. Undeniably marketplace businesses are long-term initiatives. With the success of platforms like Airbnb, Etsy, and Fiverr, it has already been proven that the marketplace model is very scalable and can be applied to pretty much any part of online business. In fact, marketplace business model is booming like never before where marketplaces are performing better over other business models. And this is the best time for you to become an online marketplace owner. However, do you know the most common and widespread tool for developing and visualizing a business model is the Business Model Canvas? Business Model Canvas was initially proposed by Alexander Osterwalder based on his earlier book: Business Model Ontology. The Business Model Canvas enables both new and existing businesses to focus on operational as well as strategic management and marketing plan. Actually, Osterwalder’s Business Model Canvas is a simple graphical template describing nine essential components: customer value proposition, customer segments, channels (to reach customers), customer relationships (such as self-service or personal assistance), revenue streams, key resources, key partners, key activities, and cost structure. The individual elements prompt consideration of a business’ full scope, while the layout encourages thought about how the pieces fit together. 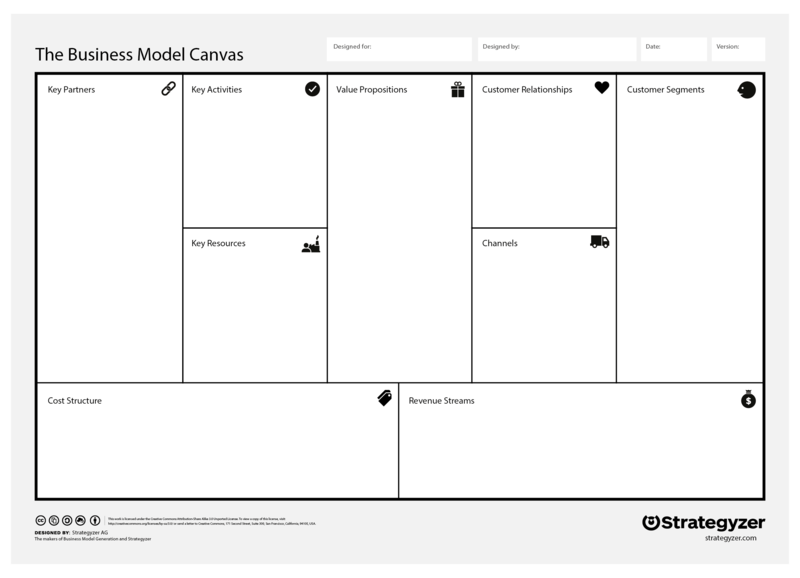 The Business Model Canvas is simple enough to sketch on a whiteboard and it is also powerful enough to refocus the way you view your business. By using this revolutionary new technique, you structure the business model on one page and have the bones of a business plan that previously took 30 - 40 pages and months to write. Besides taking the Business Model Canvas sheet to meetings for better management, you can use the building blocks to guide brainstorming. 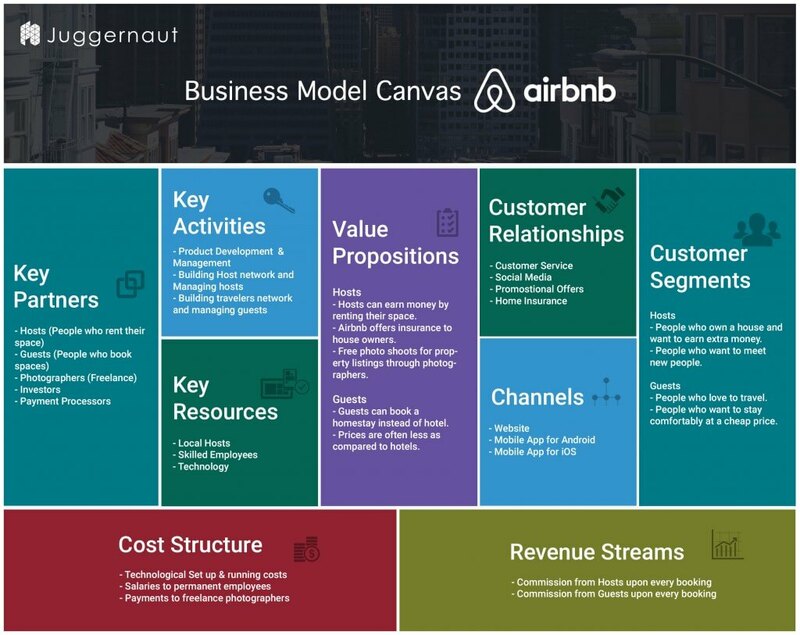 You use the Canvas to write a one-page business model to see if the idea has legs and take a lean entrepreneurship approach where you discover customers and the best business model in real time in the market. You just spend minutes or hours sketching business models for multiple ideas. You still need to do more research and might end up writing a long business plan to secure capital or promote the ideas, however, it’s a quick way to weed out bad ideas. It quickly clarifies thinking on the business model and one building block naturally leads to the next. The customer value proposition is at the heart of the Business Model Canvas and forces you to think deeply about what your venture delivers to the customer, which problems it helps solve, and which customer requirements are satisfied. In fact, a business model describes how a marketplace business creates, delivers, and captures value. Framing a business model within the business model canvas, consisting of 9 main building blocks, helps you increase the understanding of how a business operates, and encourage discussion, creativity, and analysis. Your business model can make the difference between world-leading success and dismal failure. 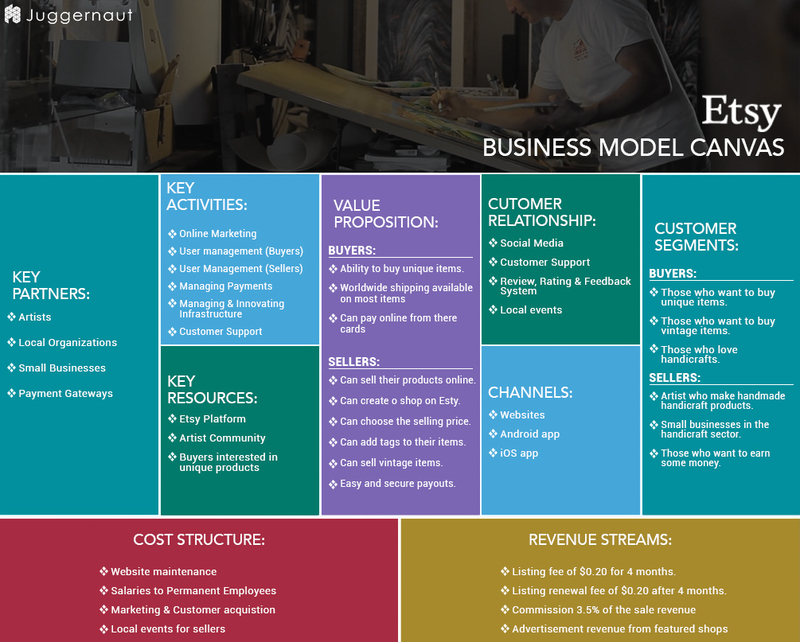 The factsheet describes the main components of the business model canvas and how they can be used to increase the strength of your business model. Airbnb is a rental marketplace of house sharing for people to list, discover and book unique accommodations around the world – online or from a mobile phone or tablet. It connects hosts and travelers and facilitates the process of renting without owning any rooms itself. Moreover, it cultivates a sharing-economy by allowing property owners to rent out private flats. When you look at the Airbnb business model, you will see it is unique, profitable, and has evolved to such a level that the brand is now the world’s most loved hospitality brand. Among the sales on marketplaces, Etsy is a popular global marketplace for people who make, sell and buy unique goods both online and offline. It has about 2 million registered sellers and offers support to emerging and established creative companies. The success of Etsy goes to its unique business model. Unlike eBay or Amazon, Etsy has chosen a narrow domain of art, craft, handicraft and handmade items. The Etsy business model is also exceptional as Etsy provides an amazing value to both buyers and sellers. You can use a Business Model Canvas before launching your online marketplace to know exactly where you are going. It's time to put the initial goals of the marketplace, first, in the short and then in the long term. You may already be thinking about the target audience, but also the added value of the marketplace. The costs are to be taken into consideration as well as the economic objectives. Thanks to the Business Model Canvas, the very foundations of the marketplace are evaluated from the beginning, which makes it possible to anticipate all that needs to be put in place for an assured success.